Bohol, a beautiful tourist destination in Central Visayas, is expected to double its tourist arrivals with the opening of its new international airport. The Bohol-Panglao International Airport, dubbed as the Philippines' first "eco-friendly" airport, has started its operations on November 28, 2018. 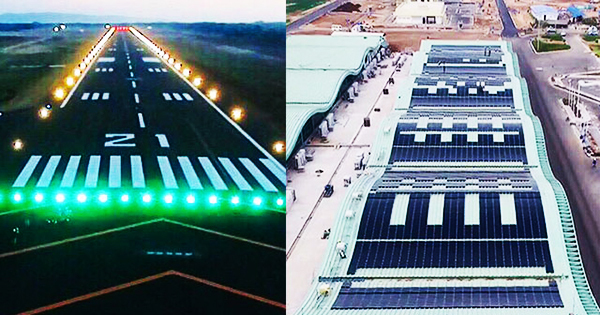 Dubbed by the government as the "Green Gateway to the World," the Bohol-Panglao International Airport boasts of several eco-friendly features. It used solar technology for its hot water supply system, which could prevent up to 18 tons of carbon dioxide emissions per year. Its solar panels could also supply 30 percent of its passenger terminal's power needs. The landscape of the "green airport" has over 1,700 trees, thousands of shrubs, and 11 hectares of grass. More than 624,000 seedlings are also being planted. The new airport features a rainwater catchment system as well. It could reduce the load in the drainage system and the collected rainwater can be used for other purposes. Aside from that, it also adopted pinewood-inspired ceilings and is lined with glass windows to take advantage of natural light at daytime. The air conditioner is only needed to operate in limited areas such as the waiting area for passengers. The new airport replaced the nearby Tagbilaran Airport, which is 40 minutes away, as the gateway to Bohol. It is expected to "address the growing traffic congestion and accelerate economic growth in the region. [It would] make Bohol more accessible to the world with this new airport," President Rodrigo Duterte said in his inauguration speech on November 27 to formally open the new airport. The new airport is built on a 220-hectare area in Panglao Island, which is twice as large as the Tagbilaran Airport. It can accommodate a maximum of 650 passengers, compared to the 400-passenger capacity of the old airport in Tagbilaran, and up to 2 million passengers yearly, more than double the 800,000 annual passenger capacity of Tagbilaran. The terminal is also ready for expansion if ever needed. It has a 2.8-kilometer runway that is expandable to up to 3.2 kilometers if necessary. It can hold up to seven airplanes at the same time, even the larger international airplanes. It is also "night-rated," meaning it can cater to evening flights, a feature Taglibaran Airport didn't have. Though its construction was delayed for 30 long years, it was fast-tracked for completion in 2018, ahead of the original target in the year 2021. The construction lasted for only about 3 years since it was resumed in 2015 and taken over by the Duterte administration in 2016. It was funded through the official development assistance of 8.91 billion pesos from the Japanese government. Definitely, the new Bohol-Panglao International Airport could allow more people to experience Bohol -- the home of the famous Chocolate Hills, amazing tarsier, beautiful beaches, and many more.